John Wayne was born Marion Morrison on May 26th, 1907, and began his career as a prop boy, stuntman and extra in the mid-1920s before making his feature film debut in Men without Women in 1930. John Wayne would go on to star in almost 180 films over the course of his career and win a Best Actor Oscar in 1969, being best remembered for his westerns. A Harris Poll released in 2007 placed Wayne third among America's favourite film stars, the only deceased star on the list and the only one who has appeared on the poll every year. John Wayne died of stomach cancer on June 11th 1979. To download and save this autograph of John Wayne simply place your cursor over the autograph and right click on your mouse, then download it onto your hard drive! We have a wide range of movie celebrity autographs to download from the old to the new. 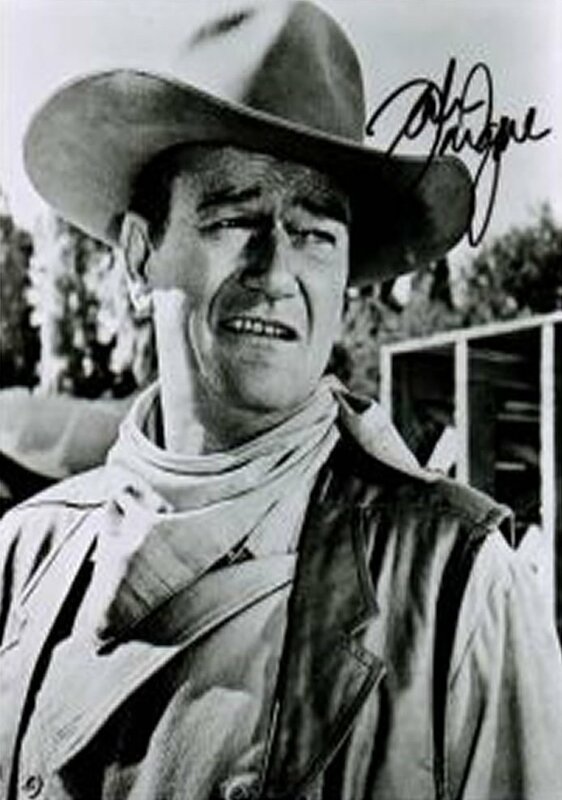 To download and save this celebrity autograph of John Wayne simply place your cursor over the celebrity autograph and right click on your mouse, then download the celebrity John Wayne autograph onto your hard drive!